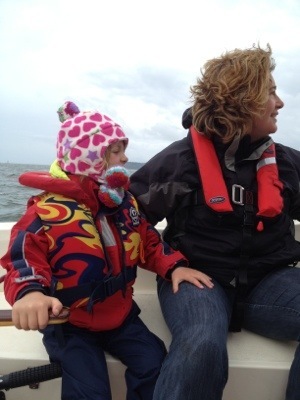 Only a short sail today, as it was windier than expected. 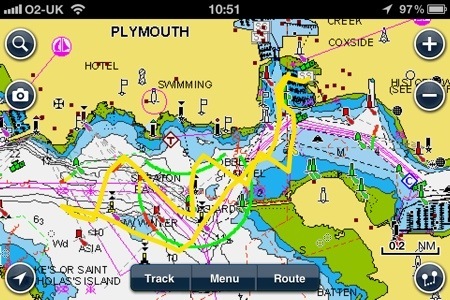 We left Northney marina at approx 12.30, making our way towards Hayling Island YC. We didn’t quite reach there though, as the wind got stronger as we went. W/SW F6. 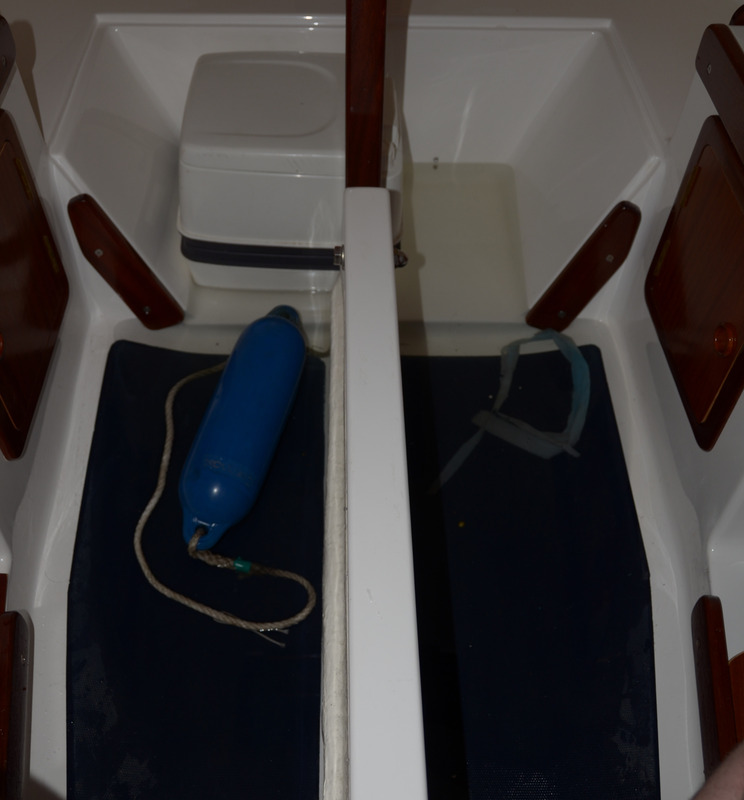 We sailed out under main with single reef, but due to a mainsheet mishap (stopper knots are quite useful!) we made the return journey under staysail. Getting confidence in the engine- starting well every time and shows plenty of power. 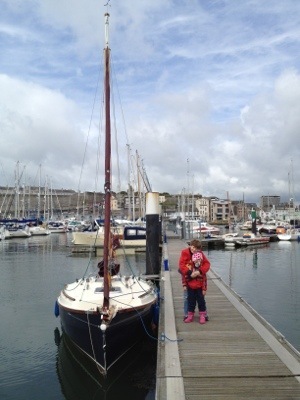 I was pleased that I rigged the boat unaided for the first time. No errors I think (except for the mainsheet). Shod go quicker again next time, but need explain to the others, so they can help. Launching was a bit of a comedy of errors. The slip at Northney is steep and can be used at all states of tide. However, Aurora refused to leave her cradle. Admittedly, the first time it was because she was still attached to the winch! Even when she was free though, she sits high and largely dry when the ‘van tyres are in the water. No amount of tugging on warps would shift her. Evidently even on steep slips, a rope is needed. This time I used the nasty polyprop rope recently relieved of anchoring duties. I put the brake on and released the trailer from the hitch. So far so good. However as soon as I released the brake the trailer ran away and would not be restrained. Until it had disappeared under water. At least the boat was afloat now, so while the girls pulled on warps, I waded out to the trailer, expecting to release the brake and pull it up the ramp. Of course I totally underestimated the weight of the trailer and so as soon as the brake we released, it rolled rapidly even deeper! Niki said my eyes went out on stalks, but I eventually managed to secure the rope on the tow hitch. It was with great relief that the trailer slowly emerged like the creature from the black lagoon as I gingerly drove the ‘van up the slipway. Next time, I’ll use an abseiling descender…. Well, we have bought our Cape Cutter at last. 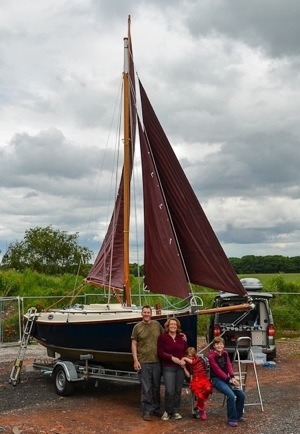 Having collected it from Bob and Norma at Honnor Marine in Rochdale, I trailed it to its new home in the midlands. We rigged it all up, just for the practice! This blog is intended to chart (literally and metaphorically) the progress of our Cape Cutter 19, which we have called Aurora. 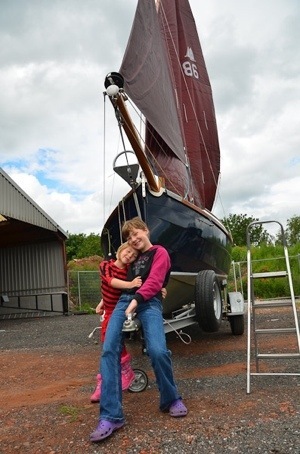 We are a family of four and are planning coastal sailing adventures around the UK. Living as we do in the midlands might be seen as a disadvantage, but it does mean that all the coasts of the UK are available to us.